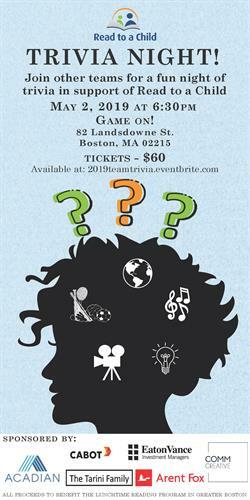 Read to a Child’s annual Team Trivia Night is a great way to connect with friends and colleagues alike through a competitive and entertaining game of team trivia, while supporting children’s literacy in Greater Boston. With over 100 guests competing in teams of up to 8, Trivia Night is a fun night out and a great way to support Read to a Child’s Lunchtime Reading Program. Join as a team or sign up as an individual and we will place you on a team. Trivia teams may have a maximum of eight players. $60 ticket includes one drink voucher for beer and wine, heavy appetizers and trivia participation.